Pra Hah Rorb was chanted on 28th November BE2515 by Krubah Jow Kasem at SuSahnDtraiLak. This batch of amulets consisted of Neua Phong(powder) and Rian (metal) form and was created by nephew and disciples of Krubah Jow Kasem to celebrate his 60th birthday. A total of 6500 pieces for the powder amulets and 5000 pieces for the metal amulets were created. 2. JeeWon (Krubah Jow Kasem's robes) - Krubah Jow Kasem's robes was different from many other monks, because he never changed his robes. When the robes got torn, he would repair them himself. Each day, Krubah Jow Kasem would sit sammahdti in his Guti each day and his robes were soaked with his own sweats. Furthermore he bathed only once or twice a year, thus people considered his JeeWon as SakSit(has power). 3. GahToop (incense sticks) - These incense sticks were those that Krubah Jow Kasem lighted up each time before he commenced his chanting and sammahdti. 4. Dtork Mai Boo-Cha Pra (Dry Flowers) - These were flowers that Krubah Jow Kasem offered to the Buddha each time he pay homage. His nephew would keep these dry flowers whenever he changed fresh ones. 5. NumPheung (Honey) - Honey is sweet and sometimes used as medicine. This material was chosen because since honey is sweet which means wherever we go, people will be sweet to us; in words and behaviour as if give metta to us. 6. Num Mun TangYiw (TangYiw oil) - this material is always used for making amulets because the TangYiw can bond the materials together as if one harmony. 7. Poo SeeMan Khaow (White Cement) - this material is always used for making amulets because cement can harden the amulet as if one give strength and determination. 8. Geow Pohng Khahm (a type of gems look like glass) - these gems are very rare and can only found in caves. They appear on their own, and required a monk who has wichah to remove them from the caves. Even by itself, they have Gong Krapan (invulnerability to weapons) power. 9. Gluay Num Wah (sweet banana) - since the time of Pra Somdej Ah Jahn Toh, banana is always used in making powder amulets. No one knows the reasons, perhaps it symbolised sweetness and fullness as in prosperity. 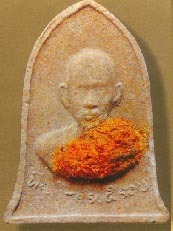 Initially, the powder amulets were created 5000 pieces only, when the Prince of Thailand went to Wat KaDteuk ChiangMan at Chiangman, Krubah Jow Kasem asked his nephew to create some more powder amulets from the leftover materials and 9 pieces of this powder amulets were delivered to the Prince. The total pieces of powder amulet created was 6500 pieces. This batch of amulets is considered as the first batch of amulets chanted by Krubah Jow Kasem at SuSahnDtraiLak, whether it is in powder or metal form, Pra Hah Rorb is good for Metta Mahahniyom, Kleow Klaht, Gahn Plort Paai and Kong Grapan. Price range from 10,000 bahts to 20,000 bahts.